Gloria Diaz reveals she will vote for Sen. Manny Villar this coming election. "Yes, I will go for Villar. I just think that if he could make his business a success, he could also make our country a success," she said. Dethronement may just be the opportunity that Maria Venus needs, says the actress and former beauty queen. "Maybe this has given her more air time, more exposure. Maybe it's a blessing in a certain way," Gloria told PEP (Philippine Entertainment Portal) in an interview during the press conference for senatorial candidate Gilbert Remulla yesterday, April 6, at Annabel's Restaurant in Quezon City. Gloria said that the possibility of being dethroned is one of the things that one should expect when one signs a contract with BPCI. "First and foremost, you sign a contract, e. They have the right to dethrone you, to stop you from being crowned or uncrowned, and everything. I think she [Venus] must realize that they have the last say. Ganun sila, e. So you enter into a contract with an organization, they have the last say," she said. Gloria cited her own experience as an example that a beauty queen title holder must abide by the details of the contract. "Nung tumaba ako ng tatlong pounds they [Ms. Universe] threatened me that I have to lose the three pounds. I thought, 'Why? What do I care? I wanna be fat or whatever.' Hindi pa naman uso noon yung payat na payat. But because I had signed a contract for fitness, morality, etc... I always had a chaperone then. Twenty-four hours 'yan. I mean, hindi ako puwedeng mag-boyfriend and all that." Gloria said other avenues, like show business, are still open for Maria Venus. "It's not the end of the world," she said. BEAUTY TIPS. 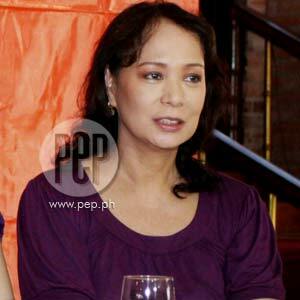 PEP praised Ms. Gloria Diaz for her lasting beauty, even at an older age. She humbly accepted the admiration. "Am I? Hindi, e. I'm slowly disintegrating, e," she said. The beauty queen said she just tries "harder" to maintain her good looks. "I think when you grow older, you just try harder and then of course you do conservative things. 'Wag kang uminom, 'wag kang magsugal, 'wag kang magpuyat. I try to eat less." She said she even takes little naps while in a taping for her role in Diva, four days a week. "So pag nasa shooting ako, nagbabaon nga ako ng tulog. You know what I mean? Pag wala akong ginagawa, tulog muna. Kaya lagi ako nagbu-beauty rest."